Since my Undergraduate studies I have worked for Exscitec, a STEM education outreach company based in Petersfield. During the summers, I would work as an academic mentor assisting in the delivery of fun based scientific activities in physics, maths, engineering and robotics for students aged 9 to 17 years old. This summer I had the opportunity to deliver a summer school at Uppingham School for the week of 17th to 21st July. The subject of the week was Engineering Intelligence which involved using the power of modern computing to create innovative solutions for engineering projects. Traditionally, we focussed on mechanical engineering projects using a robotics kit called Assemblr (produced by Richard Palfrey, Business Development Officer for Exscitec). For this week, we integrated Arduino-based sensors with the mechanical actuation. We taught subjects including basic C programming, electronics, microcontrollers and basic principles of computer architecture. The students then had an opportunity to put these ideas together to build robots including autonomous vehicles with obstacle avoidance. Another element of the week was using my experiences of CDT EI to explain how the digital economy is shaping the world of tomorrow and what kind of challenges we have to face in the work place and in society. Talks on future technologies, internet of things and industry 4.0 underpinned the relevance of why it’s important to learn the skills of the week and what potential careers are out there. At the end of the week the students presented their work to the rest of the summer school students on the other subject strands and their parents. It was great to see how much they learned. It was particularly rewarding to see how the students took the knowledge and turned it into creative ideas. The fact they were able to gain keen insight into what you can do with STEM subjects led to many students stating that they were now keen to work on their own projects. I personally got to learn how to tailor technical information to range of abilities, a skill I will apply when explaining my own work to my company sponsor and at presentations. I also got to work on my teaching abilities which I will put into practice in the tutorials I assist with the Automotive and Aeronautical Engineering undergraduates. 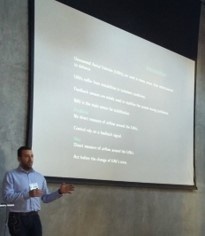 Cohort 3 researcher Gergely Hantos describes the 4th Annual Workshop and Exhibition MEMS Testing & Reliability he recently attended in Santa Clara, California, in the heart of the Silicon Valley. The workshop was aimed at CEOs, CTOs, VPs and engineers working in the field of MEMS test and reliability. MEMS are Micro-Electro-Mechanical Systems. They are similar to integrated circuits in the field of microelectronics, however MEMS have moving parts. Due to the difficult and complicated fabrication process, they are not standardised, every MEMS device is custom made. MEMS can be accelerometers, gyroscopes, microphones, pressure sensors, infrared sensors etc…MEMS can be found in most of our daily appliances. They are present in various fields from automotive industry (airbag sensors) to handheld devices (mobile phone gyroscopes). As MEMS play a critical role in some devices, their reliability is highly important. Just imagine an airbag with a faulty sensor or someone dialling 911 with a faulty microphone. By attending the workshop I was hoping to get to know the state of the art test methods and current trends in MEMS testing especially in the field of MEMS microphones. There were two presentations focusing on microphones, which I found highly related to my project. I was able to get a better understanding of failure modes of MEMS microphones and the current test methods. There was also a presentation from Allyson Hartzell, Veryst Engineering, who works in the MEMS reliability industry nearly since its beginning. I have read one of her books and encountered a lot of her work during my literature review so it was real pleasure to hear from her in person. Alongside Allyson, Richard Chrusciel from FocusTest, was responsible for opening and closing the presentation session and both gave a very good general overview of the field of MEMS testing with current trends indicated. The MEMS community is fairly small and very friendly; I came away with many new contacts including some of the presenters and with people from companies working with MEMS microphones (Bose, Bosch etc...). Overall, I enjoyed my three day; it was my first time not only in California, but in the USA as well. I was also able to spend some time with my colleagues (Ruben and Christos) in San Francisco who were attending a conference. We even managed a bit of sightseeing! The 6th international conference biomimetic and biohybrid systems, called 'Living Machines', was held this year at Stanford University in California. Christos Kouppas (cohort 3) and Ruben Kruiper (cohort 2) attended to present their work on bio-inspired robotics and computer-aided biomimetics respectively. The conference started with several workshops on the 25th of July, addressing topics such as unmanned aerial vehicles and simulating evolution-and-development mechanisms. The conference was held over 3 days and finished with several lab-visits at the University of California, Berkeley. During the conference Christos presented work on Unmanned Aerial Vehicles in a 20 minutes oral presentation. Christos had create a novel sensor for airflow around UAVs and he designed a feedforward-feedback controller to demonstrate the performance capabilities of the sensor. The full paper can be found on ResearchGate. Ruben presented a poster on Computer-Aided Biomimetics - the use of computational tools in support of bio-inspired design. Such tools aim to support the identification and selection of biological information that is relevant to an engineering problem, as well as helping to understand and transfer biological information to an engineering context. The paper and poster can be found on ResearchGate. Cohort 3 research Orange tells us about Visum Summer School 2017. With CDT-EI’s sponsorship, I attended VISUM summer school from July 7th – 14th in Porto. VISUM stand for Vision Understanding and Machine Intelligence and this summer school aimed to gather PhD, candidates, post-doctoral scholars and researchers from academia and industry with research interests in computer vision and machine learning. VISUM is organized by INESC TEC in the scope of the FourEyes projects. Summer school included six full days theoretical and practical sessions, one day for social programme and the last day was final demonstration of the projects we have done during the Project Hackathon. Specialists and professors from universities and industries gave us the lessons of the state-of-the-art techniques based on deep learning and computer vision in the morning, and in the afternoon, we had the hand-on sessions with their help. On the industry day, we had speakers from Facebook, Disney Research etc. They did give us lots of valuable advice and the examples how to turn techniques into real commercial products. Social day was travelling and exploring Porto with the guide of summer school community and it was great chance to meet people who has similar background and common interest. These 8 days was unforgettable and rich. The techniques I have learnt was extract what I need for my own research. The hand-on sessions built my confidence to apply techniques, which was always a hard thing for me since I didn’t know how to apply them even I understand the theory behind. Practice also makes me understand the theory more. I would strongly recommend this summer school for the people who need deep learning and computer vision knowledge to boost their research. As part of the Transition Zone programme our students undertake ILM modules and are awarded with a Level 3 Certificate in Leadership and Management. Congratulations to those who have recently passed modules and are on the way to the full qualification! Below are just some of our students being award certificates by our Executive Director, Dr Carmen Torres-Sanchez. Article by cohort 2 reseacher Rhys Comissiong. 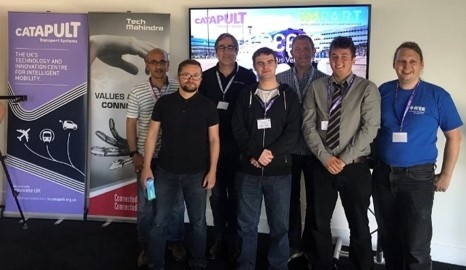 On the 1st July, I participated in the Connected and Autonomous Vehicles (CAV) Hackathon hosted by Transport Systems Catapult (TSC). The event was held at their Milton Keynes office where each team had the opportunity to tackle one of the five challenges. These included: exploring CAV data, CAV ecosystem business models, build a LUTZ simulation, environmental impact and accessible CAV design. We had 26 hours to work on the challenges before presenting at to a panel of judges and the other competitors. 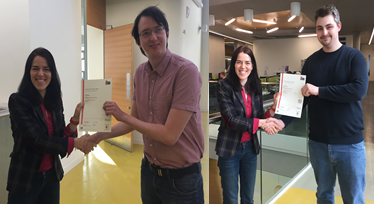 Team ROSteK consisted of myself, Dr Thomas Steffen (my supervisor), Mauricio Silva (University of Northampton) and Ashton Bowen (De Montfort University). We decided to tackle the challenge of building a CAV simulation. TSC provided us with data, equipment (including a driving simulator and an Omnideck virtual reality simulator), and expert mentors in the field of autonomous vehicles and simulation. We recognised that a key challenge to testing autonomous vehicles is latency of feedback of the controller during simulation. For this reason, we wanted to find a way of putting the actual controller of the autonomous vehicle within the simulation, rather than modelling it. We achieved this by creating an MQTT broker to bridge the virtual world in Unity (windows-based gaming engine) and the controller in Linux-based Robotic Operating System (ROS). This allowed us to test the quality of a controller, similar to how you would test an engine on a test bed before putting it in a vehicle in the automotive industry. Our business pitch to the judges was that through high performance computing you could exponentially increase the amount of testing prior to putting the autonomous vehicle on the road. Each group had 4 minutes to present their ideas which was then judged on novelty, technical complexity, business model and quality of presentation. Our efforts of working continuously through the night were rewarded by being declared the winners of the weekend. We were given Amazon Echo Dot’s as a prize and the top 3 groups were put through to present our ideas at the showcase finale at the London Transport Museum on the 12th July. We had just over a week to further develop our ideas and put together a 10-minute presentation on as a business pitch. At the showcase finale, there was a drinks reception within the museum; which allowed for networking opportunity with people from academia, government and industry, and a vast range of disciplines. Around 100 people were in attendance, which included a different expert panel of judges and guest speakers. At the end of the presenting the judges were given the opportunity to ask questions which focused on the business, social and ethical issues of the projects. The winners were presented with a £2000 prize and the opportunity to present their work to the industry sponsors. Team ROSteK finished as runners up. Despite not winning the showcase finale, it was a fantastic opportunity to learn about advances in the field of autonomous vehicles. The most significant thing I learnt was how important it is to tailor the information we delivered to our audiences. Depending on their background their agendas would vastly differ and so you had a to have an extensive knowledge to be able to answer the range of questions and explain why your work is both relevant and applicable. This is something I plan on doing with my own PhD work when preparing for presenting, communicating with my sponsor company and networking. Cohort 3 researcher Matt Hammond describes the Institute of Mechanical Engineers (IMechE) seminar about Low Temperature Pressure Systems he recently attended. I attended this seminar on the 28th June 2017 at the Institute of Mechanical Engineering training centre in Sheffield. The seminar was organised by the IMechE to discuss views on the standards and regulations of low temperature and high pressure storage and process systems, and how they impact the design and operation of such systems. The seminar saw representatives from various industries including materials engineering, industrial gases, and oil and gas, come together to discuss key issues in the operation of different systems, their failure modes and integrity management solutions. Of particular interest to my research were presentations on Liquefied Natural Gas (LNG) systems including “LNG fuel systems for marine propulsion” delivered by Oscar Kallerdahl (Vice President LNG Systems, Rolls Royce) in Norway and “integrity management in ageing LNG facilities” delivered by Azrul Hilmi, DNV GL. With my research taking place in a laboratory environment, it was interesting to hear insights into the issues and solutions on a process scale and in the use of LNG as a fuel. I also took the opportunity to network and discuss my research with various attendees. As part of The European Test Symposium (ETS'17), The Test Spring School (TSS@ETS 2017) ran over 3 days and was aimed at PhD and MSc students. Renowned experts introduced attendees to modern test, dependability and fault tolerance technology and presented the main challenges faced by the nanoelectronic systems industry. It was held in Nicosia, Cyprus and on the final day we were transported to Limassol for the last lectures and the start of IEEE European Test Symposium (ETS). Both TSS and ETS were highly relevant to my research area and I was hoping to get a deeper understanding of state of the art testing methods and to get to know the latest built-in-self-test strategies of MEMS. Both events did not disappoint and I was exposed to the current trends in emerging test strategies and the utilisation possibilities of machine learning in testing. I learned a lot of new things and now I am able to approach my work from a different point of view. One aspect is that I am going to broaden my research towards machine learning. There were many parts I could highlight as most enjoyable, it is hard to decide. The social activities were brilliant, the visited cities were wonderful and the lecture by Yiorgos Makris on Machine Learning Based Test was amazing. I would highly recommend it to anyone interested in this field.